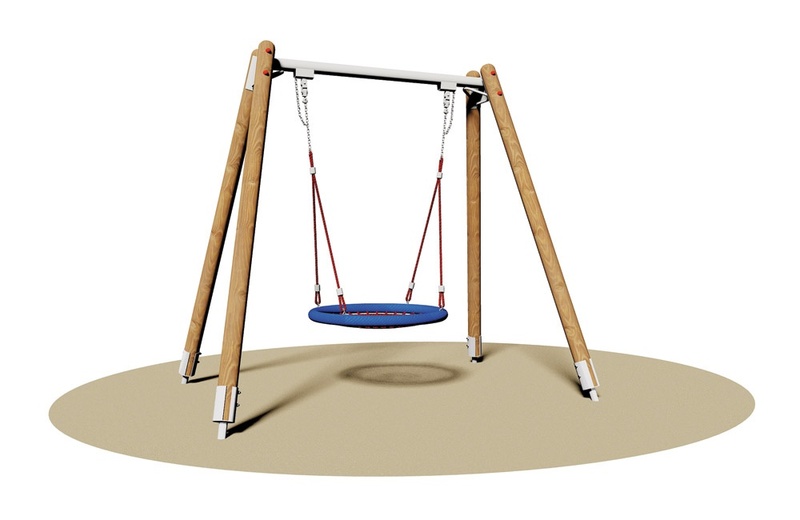 Structure made in hot galvanized steel and Nordic Pine wood pressure treated with non-toxic salts. Upper Tubular beam in galvanized steel with a round section Ø 8,9 cm and connected, through lateral joints in steel plates 30/10, to four poles outer core, with round section Ø 12 cm. N° 1 bird nest seat dim. Ø 100 cm composed of colored synthetic woven ropes and reinforced with stainless steel core, available with hot dipped galvanized small mesh chains, connected to the beam trough a double fixings. Assembly system with 8.8 galvanized steel bolts and self-locking nuts. Coloured nylon cap nuts as required by law. Hot-dip galvanised metal brackets for ground anchoring system in a concrete plinth.